Have you started to think about Christmas dinner yet? If you are like me you are so busy that it is just one more thing to had to your long list of things to do. One thing that might shorten the list is to make a Christmas centerpiece like Danni at Silo Hill Farm. Isn't it pretty! She made it with floral picks that were on sale an some artificial greenery. This type of centerpiece is so elegant, but not that difficult to put together. 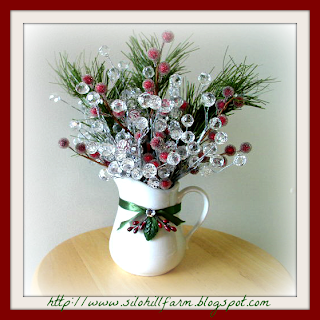 You can see more of Danni's Christmas floral arrangment on her blog Silo Hill Farm HERE. Thank you so much for linking up Danni. You did a beautiful job! If you would like to a Feature of the Day, be sure to link up you favorite posts on the weekly Dare to Share Party HERE. Thank you so much for featuring my Christmas Floral Arrangement! I am honored and I hope I can inspire others here as much as they inspire me!